Do you know the names of all Santa’s reindeer? In A Christmas Story, what was the one item on Ralphie’s Christmas list? 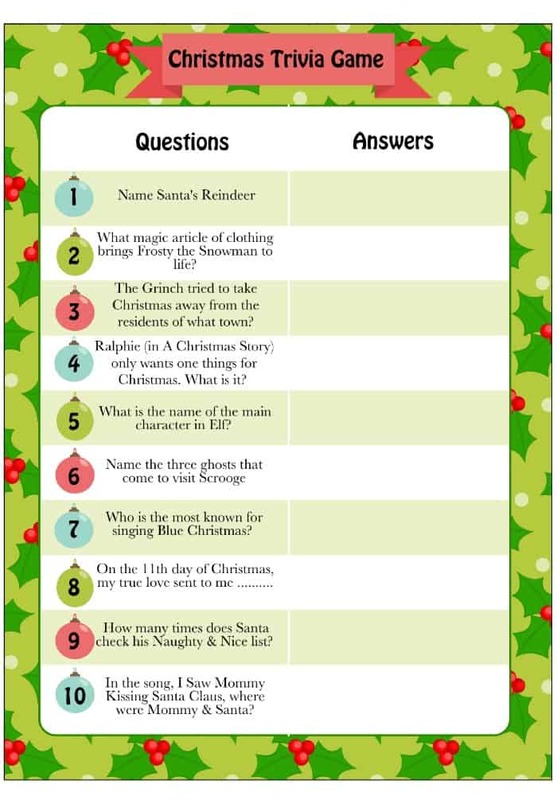 If you can answer these questions, then you’ll have fun with this free printable Christmas trivia game! We now have two printable versions of this game (same game – just two different looks). The answers have been included on the free printable game as well. So, how many answers did you guess correctly? Let us know in the comments below. Okay, now it’s your turn to ask me a Christmas trivia question. Leave a comment below with your best piece of Christmas trivia (a popular movie, a tradition in another country, the origin of a particular tradition, etc.) and I’ll do my best to answer it. Here at Moms & Munchkins, we love Christmas! We have so many more fun & free printable games to share with you. Visit our special Christmas Fun page. There you’ll find links to many more Christmas games like scavenger hunts, charades, word scrambles, word searches and plenty of original games perfect for the entire family! 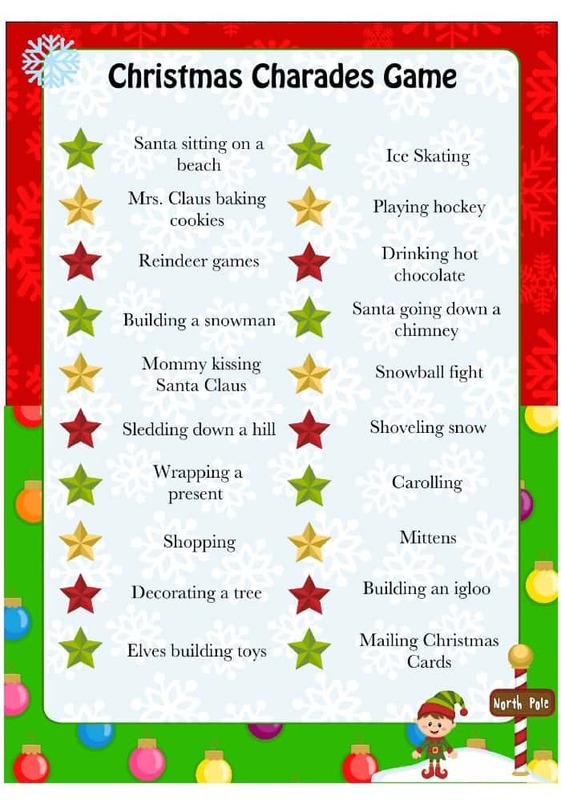 Here’s a sneak peek at one of our other FREE printable games – Christmas Charades! 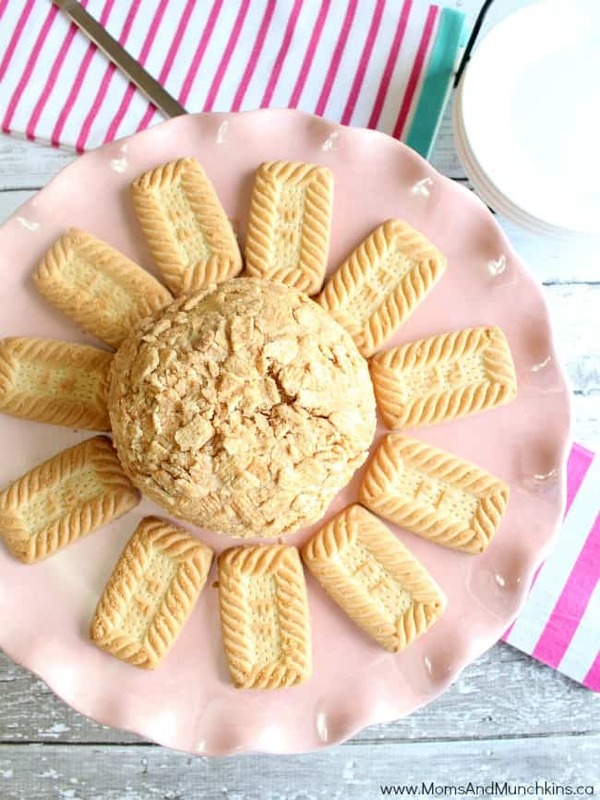 If you need a sweet treat for your holiday dessert table, check out this delicious Cinnamon Bun Cheese Ball. It’s so yummy!! Did you know that our Christmas board on Pinterest is our most popular board? It’s true! We have loads of fun ideas and freebies – here’s a direct link to the Christmas board. During the early winter months, we’re always adding new Christmas games, freebies and activity ideas. To stay updated on the latest ideas, follow us over on Facebook. Oh how fun! This would be great to pull out at a Christmas party 🙂 Thanks for sharing! Some fun printables! Thanks I may whip some out in between dinner and dessert! This is great for our holiday games and parties..
How fun! I got 8/10. I guess I know my Christmas trivia pretty well! Nice job! Fun! I’m going to save this for when my children are a little older. In fact this would be an activity that would be perfect for my daughter this time next year. I stumbled over Buddy, which is really sad because we’ve already watched that movie twice this year. lol! Great list – I am going to quiz my children. 7/10 correct. These are neat questions though, I’ll bookmark this for next year haha. 7 months til Christmas! Thank you. I loved your site with the free printable. Fun games.